Hypereosinophilia (HE) is caused by several kind of diseases, and it is always a challenge for physicians to reach the final diagnosis [1, 2]. They are often transitory or benign forms, mostly related to allergic diathesis especially in industrialized countries. However, there are some cases in which HE causes chronic damages to a variety of organic systems . Avoiding a detailed differential diagnosis of HEs that is beyond the scope of this report, we can briefly distinguish the following: reactive HE, hereditary HE (some cases of autosomal dominant transmission HEs are known. It is present at birth and remains asymptomatic in most of family members), neoplastic HE (where there is a clonal expansion of cells often associated with rearrangements of PDGFR or FGFR), and HE of uncertain significance (it refers to patients who have persistent HE, inexplicable by the other causes described below, not accompanied by any organ damage or symptoms). The first is largely the most frequent. 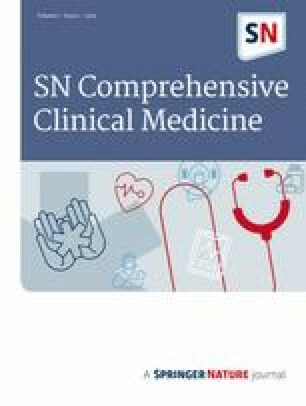 Among the clinical conditions that can cause reactive HE, we recognize the following: helmintic parasite infections, fungal infections (in particular Coccidioides infection and Aspergillus infection in the form of allergic bronchopulmonary aspergillosis), and allergic or immuno-rheumatological diseases (like allergic rhinitis and asthma, atopic dermatitis, and Churg-Strauss disease) . A careful and methodical anamnesis is fundamental to orient among these causes: as already said, HE is a common manifestation of parasitic diseases. In travelers returning from a tropical area, common causes of HE are ankylostomiasis and strongyloidiasis. In children, due to their propensity to put fingers in their mouths after touching the ground, ascaridiasis and toxocariasis should be excluded. In migrants, the two most important HE causes to be investigated are Strongyloides and Schistosoma, especially in patients with dyspepsia, diarrhea, and hepatopathy . A case of a young Eritrean man affected by Schistosomiasis, in spite of a scarce symptomatology, is described, along with diagnostic sequence and confounding factors that caused a delayed diagnosis. A 25 young Eritrean man accessed to emergency room reporting from several months asthenia, weight loss, itch, and low-grade fever. Patient has got no medical history, and no allergies were declared. He was underweight (BMI 16.4 kg/m2) with normal vital signs. Physical examination was completely normal except for scratch wounds along the sides. Blood tests showed a considerable eosinophilia (3.500 and 35% in absolute and relative values respectively). Chest X-ray and electrocardiogram were normal. He acceded to our Internal Medicine ward for the investigation of the case. Blood and urine cultures, sputum examination, HIV test, and autoimmune antibodies were negative. QuantiFERON-TB Gold was weekly positive. RIST was > 5000 kUa/L. Serum protein electrophoresis did not show monoclonal component. He also performed two-dimensional cardiac ultrasound and full-body CT-scan, both negative. Hematology specialist suggested bone marrow biopsy and aspiration suspecting lymphoproliferative disease. Infectious disease specialist hypothesized parasitosis considering patient’s origin. Thus, stool culture test was sent; in the meanwhile, esophagogastroduodenoscopy and colonoscopy were made: the last one showed widespread mucosa’s erythema (Fig. 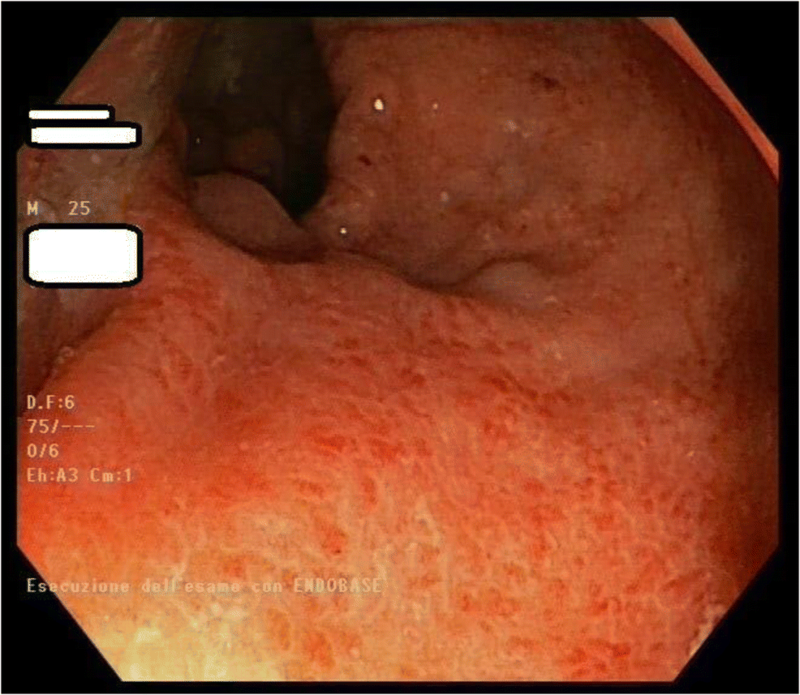 1), and some mucosal biopsy was made. Filariasis, toxocariasis, and strongyloidiasis were excluded by ELISA serological investigations. 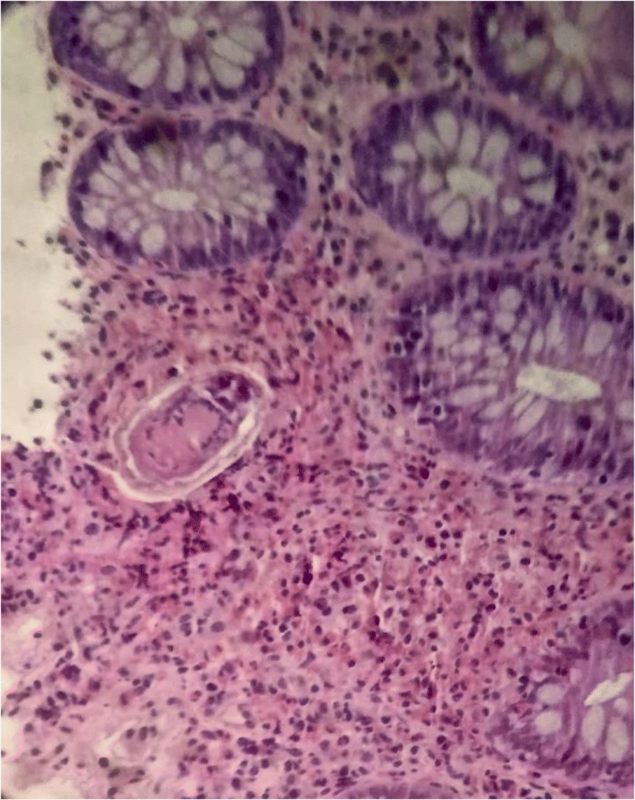 After bowel histological examination, some egg worms were found in sigmoid colon wall (Fig. 2), and direct microscopic observation of stool revealed S. mansoni eggs (Fig. 3). Urine culture did not show any eggs. Patient was successfully treated with two Praziquantel tablets bid una tantum. Schistosomiasis—also called Bilharzia—is the most important trematode infection. In terms of impact in the world, it is second only to Malaria. Approximately 500 million people are at risk of infection . It is very common in countries with poor sanitation where people usually swim or bath in water containing infectious Cercariae that are produced by sea snails. Cercariae cross the skin of the man within a few minutes after exposure, and they turn into Schistosomula. Then, Schistosomula develop to reach the form of sexually active worms in the intestinal veins or in the venous plexus of the genitourinary tract, depending on the species. 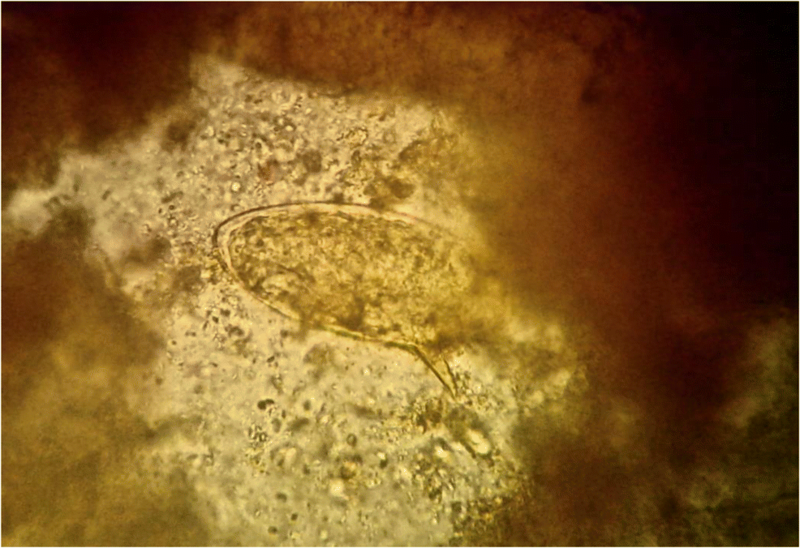 Eggs appear in stool or urine after 1–3 months from penetration of Cercariae. Life estimates of an adult worm oscillate in a range of 3–37 years. S. haematobium: it mainly affects genitourinary system, and it is widespread in all Africa. S. mansoni: it spreads in Africa and in some areas of the western hemisphere (Brazil, Venezuela and Caribbean islands). S. japonicum: it is confined in Asia (China and Philippines). The main manifestation of this clinical case was the presence of an important hypereosinophilia in an African young boy. As a first measure, we would have thought about allergic or hematological disorders, if he had been western world origin. Considering a chronic Schistosomiasis infection, clinical manifestations depend on host response to localized eggs in issues. Our patient had no bloody diarrhea or any pulmonary or hepatic granulomatous lesions, and no portal hypertension was found. Symptomatology was quite nuanced, and it made us think of a hematological disease in a young boy. Full-body CT-scan helped us to exclude the presence of enlarged lymph nodes or thorax bulky. Endoscopic examinations were decisive together with a careful examination of stool. Actually, the diagnosis is essentially based on the direct microscopic identification of the specific eggs by expert laboratory technicians. Despite the extensive use of Praziquantel in the treatment of Schistosomiasis, resistant drug strains are emerging . The lack of knowledge of Schistosomiasis in our country due to the sporadicity of cases was a negative factor. This pathology, although being common in tropical countries, is very rare in developed countries causing less than 1 death per million persons every year in countries like Europe and North America. Furthermore, it is classically known as a rural disease. The minority of cases found in urban areas generally happen where there is rapid and disorganized urbanization like in Mali, Bamako, and West Africa. In the light of the present high migratory flows, this report suggests the need for an in-depth knowledge of tropical infections even for physicians working in developed countries. In some anamnestic contexts, in fact, these diseases should be placed in differential diagnosis together with more common diseases in our countries. Nathan D. Montgomery, MD, PhD; Cherie H. Dunphy, MD; Micah Mooberry, MD; Andrew Laramore, MD; Matthew C. Foster, MD; Steven I. Park, MD; Yuri D. Fedoriw, MD. Diagnostic complexities of eosinophilia; Arch Pathol Lab Med 2013;137:259–269; https://doi.org/10.5858/arpa.2011-0597-RA.